to be propelled forward. This makes for a fascinating environment for musicians and audiences to experience sound because it travels much further and faster than in air. artists all contemplating the phenomena of water. O’Donnell uses custom hydroacoustic percussion instruments, accompanied by Mike Murphy on synthesizer, to express the unique relationship between sound and water. 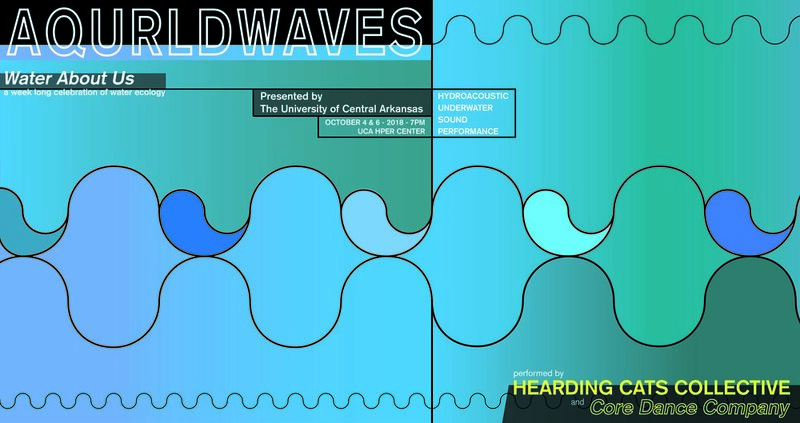 Taking inspiration from the experts of underwater sound propulsion, such as humpback whales and other aquatic creatures, this performance will provide humans a small glimpse into the wide-ranging sound possibilities of underwater life. and subtleties of this movement using animation and real-time video synthesis controlled by the room’s sound and the pool’s motion. In addition, Core Dance Company will provide a movement presentation to be captured and synthesized by Harris, blending their motions with video and sound. This movement and video collaboration will be projected on large screens as well as the surface of the water. Finally, the event will find poet Anna Lum providing moments of language and context to this world of sound and video. The seemingly incongruent relationship between water and the human voice facilitates an otherworldly experience that does not exist naturally in air or water. In addition to this performance, Water About Us is a week long residency for Hearding Cats Collective where we will participate in discussions and demonstrations of water oriented media. Our participation is part of a broader event organized by UCA celebrating and emphasizing water ecology.